Comstock is a rare, felicitous combination of a great, old, historical bar site with a top notch craft cocktail menu. The building was constructed on the Barbary Coast just after the great quake, and the Andromeda Saloon opened there in 1907. The original owners are said to have been local boxing promoters, who once employed Jack Dempsey at the door, and welcomed Jack Johnson as a customer. The current bar features various vintage boxing photos in homage to this history. The antique, belt-driven ceiling fans, looking like there were lifted from some Jules Verne contraption, date back to 1916. 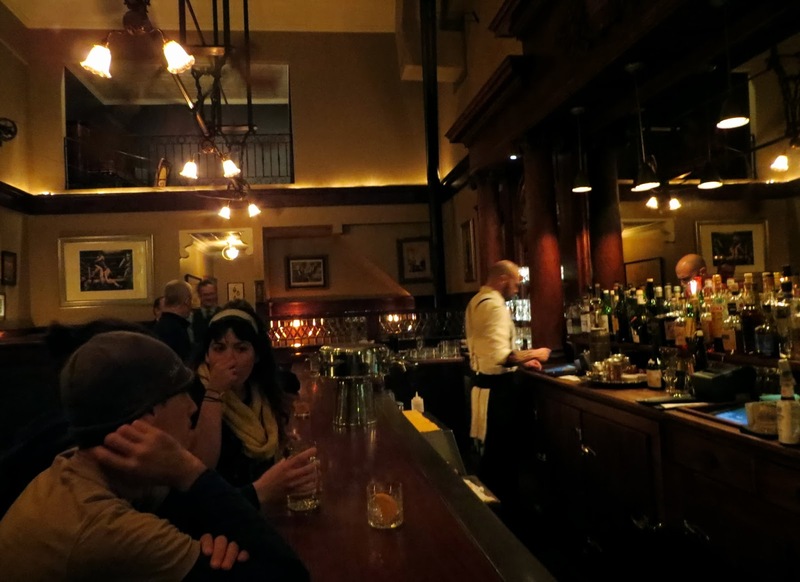 The original 20-foot mahogany back bar is still there, and now topped by a statue of Emperor Norton. Also remaining, though one hopes no longer used, is the tile urinal running along the base of the bar. The Andromeda Saloon survived through prohibition as the Andromeda Cafe (still dispensing alcohol, but only for "medical" purposes) but eventually was remodeled in 1977 and renamed the Albatross Saloon. The Albatross was purchased in 1985 and renamed the San Francisco Brewing Company. "Allan G. Paul, while living on Telegraph Hill, developed an obsession with Barbary Coast history and unique, micro-brewed beer. Paul bought the Albatross Saloon in 1985 and renamed it the San Francisco Brewing Company. It still housed all the historical pieces from its early days, but had his addition of antique-style micro-brewing, which brought beer in brass pipes straight from the basement, where it fermented and self-carbonated, into a pint glass." (Wikipedia) The San Francisco Brewing Company closed in Nov 2009, and the space was purchased by the current owners, from Absinthe Brasserie & Bar, who named it in honor of the Nevada silver discovery that boosted San Francisco's fortunes in the second half of the 19th century. The lighting in the current day Comstock is a romantic glow, and the cocktail emphasis is on classics very well made. Food options are largely upscale versions of dishes that sound like they may have been on the menu in the old Barbary Coast days. It's one of the oldest bar spaces in the city and one of the most pleasant.